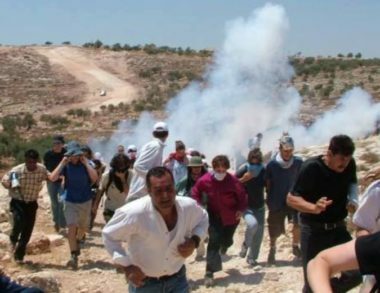 Israeli soldiers shot, Friday, a Palestinian with a gas bomb in his leg, and causing dozens to suffer the effects of teargas inhalation, during the weekly nonviolent procession against the Annexation Wall and colonies in Ni’lin village, west of the central West Bank city of Ramallah. Media sources said dozens of nonviolent protesters, including international peace activists, marched from the center of the village, while chanting against the ongoing Israeli occupation, its illegal policies and colonialist activities. They also denounced the death of Palestinian political prisoner, Fares Baroud, 51, from the Gaza Strip, who died due to the lack of proper medical treatment in Israeli prisons, and called for exposing Israel’s crimes and violations against the detainees. The procession also marked the 37th anniversary of the establishment of the leftist Palestinian People’s Party. The soldiers fired gas bombs and concussion grenades at the nonviolent protesters on Palestinian orchards near the illegal wall, wounding a young man with a gas bomb in his leg, and causing many to suffer the effects of teargas inhalation. In related news, the soldiers abducted two siblings, identified as Mohammad and Mustafa Khalil Zawahra, from al-Maleh area, in the Northern Plains of the West Bank.